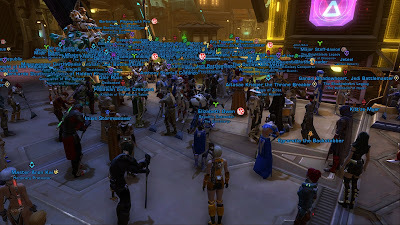 A bit over a year ago I wrote about how Swtorista celebrated hitting 20k subscribers on her YouTube channel by holding a big dance party on Tatooine. Yesterday she hosted another event to celebrate the milestone of 50k subscribers, and it was great fun! I noted that last time the biggest challenge was the fact that the game kept spinning up new instances of Tatooine really quickly and it was impossible to get everyone into the same one: "I guess Bioware wants us to stick to the fleet, which is intended to be a social space and supports much bigger numbers." It seems that Swtorista had similar thoughts, as the event took place on the Republic fleet this time. Another thing I made a note of last time was that I was a little confused about what was going on based on following only what was being said in text chat, so I joined the voice chat on Discord this time - and it was the best thing! I've been a member of the SWTOR Discord for a few months now and it's a useful enough resource for a variety of things, but I pretty much never use Discord for voice chat so I had no idea it was so full of clowns! And I mean that in the best possible way; people's comments made me laugh so much. I made a little highlights video to capture the gist of the event, which you can watch on my YouTube channel if you like (about ten minutes long). The emote of the day was /sweep, which makes your character get out a broom and start sweeping, something that seemed very appropriate to do on the fleet considering I've previously commented that all those animal mounts that people use nowadays are bound to be making a mess of the place. 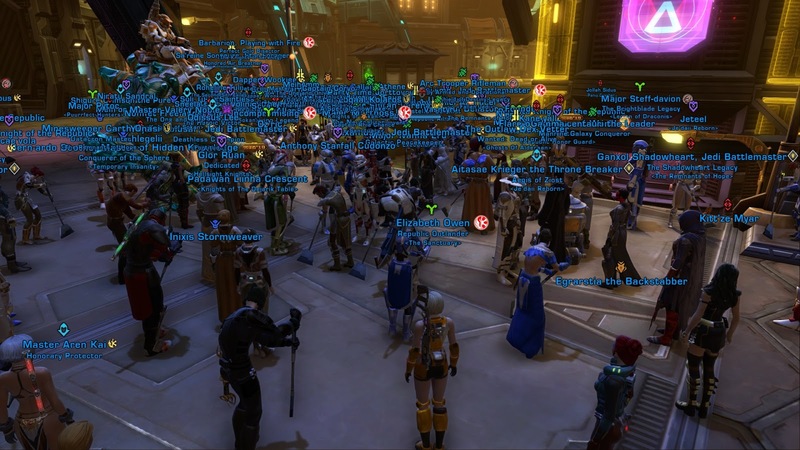 Once again there was even more to the celebration than just that event though - again there was a trivia contest which was a bit late for my time zone, as well as some giveaways on Twitter, asking for people to draw fan art of Swtorista or to dress up like her during the event. I actually decided to give the latter a shot as I quite like the armour set she usually wears, plus there is an easy to craft lookalike available. Unfortunately I soon realised that my Gunslinger on Star Forge wasn't anywhere near high enough in Armormech to do the job, so I just bought some pieces off the GTN. They weren't cheap but not terribly expensive either. My character only had about a million credits on her but managed to afford the full set without going broke. If anyone was smart enough to make a point of selling "Swtorista costumes" just before the event I reckon they could have made a killing! 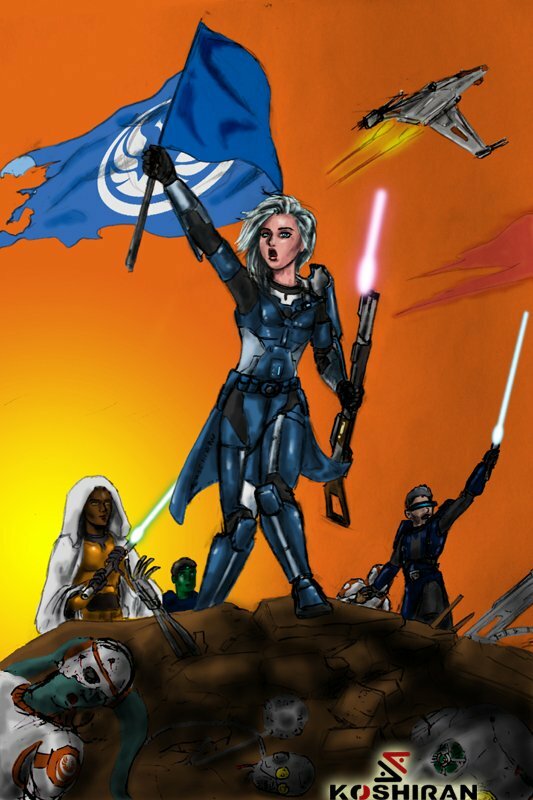 As for the fan art people submitted on Twitter, my favourite of the ones I saw was this one by Commandeur Koshiran who drew Swtorista as Eugène Delacroix's Liberty Leading the People, which I thought was pretty brilliant. May she lead us to many more fun events! It's amusing, if I squint I can see parts of my character's name and legacy name in the screenshots. If I hadn't stayed in one spot until the line up I would never have been able to find myself. It was fun to see other content creators there, though some I had no idea who they were until they said something in chat. I ended up adding a few to my friends list just so I know who I might be running across. 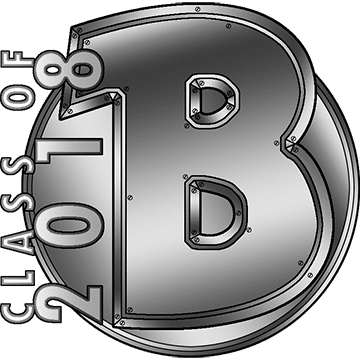 And, though this sounds a bit egotistical, it was fun to see everyone sweeping given the role I've played on our little podcast. Space janitors just don't get enough credit. I thought you spoke quite a bit! More than I likely would have in that situation. Good job.